In 2016 I contributed to the development of the University of Edinburgh’s OER Policy and later that year the work of the Open Education Team at the University was acknowledged in the ALT Learning Technologist of the Year Awards. I have contributed to the development of a number of open education policies and guidelines over the years including the UKOER technical guidelines, the Scottish Open Education Declaration , and in 2016, I contributed to the the University of Edinburgh’s new Open Educational Resources Policy . 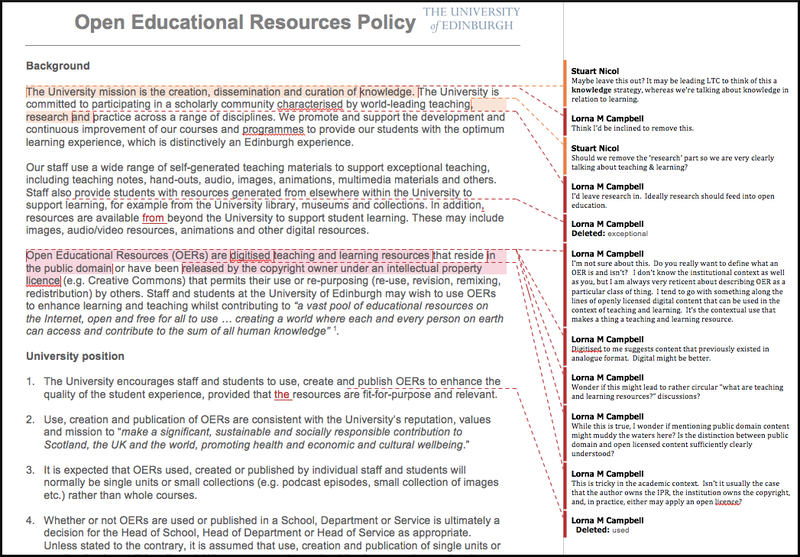 This policy originated from a paper presented to the University’s Learning and Teaching Committee by the Director of Learning, Teaching and Web Services (LTW) and Edinburgh University Student Associations’ Vice President of Academic Affairs, outlining an open educational resources (OER) vision, policy and service for the University. The development of OER Policy was taken forward by my colleague Stuart Nicol who sought my input on the wording and content of the policy document and also in framing the covering paper that accompanied the policy when it was submitted to committee . The policy helps staff and students to make informed decisions about using, creating and publishing OERs to enhance the quality of the student experience and support the University’s OER Vision. In an e-mail exchange with my colleague Stuart, I explained my rationale for this small but significant change as follows . This change was incorporated into the draft document and the policy was approved by the University’s Learning and Teaching Committee in early 2016. Although I had previously been involved in a number of national open education policy developments, this was my first opportunity to contribute to an institutional OER policy. My recommendation to change the description of OER to one based on context of use, was partially a reflection of how thinking around OER had moved on since the Leeds policy had originally been created, and partially a result of my involvement in developing learning object metadata standards and specifications ten years previously . These early standards sought to define learning resources as a particular class of thing, using hierarchical elements and controlled vocabularies. While some of these standards, such as the IEEE Learning Object Metadata Standard and the IMS Learning Resource Meta-Data Specification, were widely implemented by learning object repositories, they were not entirely successful for a number of reasons, one of which was that the educational value of a resource is frequently not an innate property of the resource itself, but is dependant on context of use, which is much harder to describe in structured terms. Adopting a definition of OER that acknowledges that any digital resource can be used in the context of teaching and learning, ensures that the policy is inclusive and helps to bypass circular arguments about what is or is not an educational resource. This definition is in keeping with the whole ethos of the University of Edinburgh’s OER vision and policy which is enabling and permissive rather than mandatory. Having such a policy in place provides staff and students with the reassurance that they can share their educational resources, whatever form they may take, without having to seek further permission from senior management. Of course a policy alone will not change practice without the provision of support and guidance for staff and students alike. At the University of Edinburgh it is the combination of this OER policy together with the OER vision and service and the input of a dedicated team of staff across Information Services that is supporting colleagues to engage with open education and embedding openness at the heart of the University’s strategic vision. The success of the University’s Open Education team was acknowledged in September 2016, when I submitted an entry to ALT’s Learning Technologist of the Year  awards on behalf of the team and we were awarded third place in the Team category, an achievement of which I am very proud. E-mail exchange between Stuart Nicol and I regarding the definition of OER used in the policy. Open Educational Resources (OERs) are digitised teaching and learning resources that reside in the public domain or have been released by the copyright owner under an intellectual property licence (e.g. Creative Commons) that permits their use or re-purposing (re-use, revision, remixing, redistribution) by others. It is expected that OERs used, created or published by individual staff and students will normally be single units or small collections (e.g. podcast episodes, small collection of images etc.) rather than whole courses. I think this is more useful. I like the idea of giving examples of useful types of OER. So my inclination would be to use a generic and inclusive definition of OER in the policy document and then link to a separate guidance resource to explore this in more detail, and to provide examples.